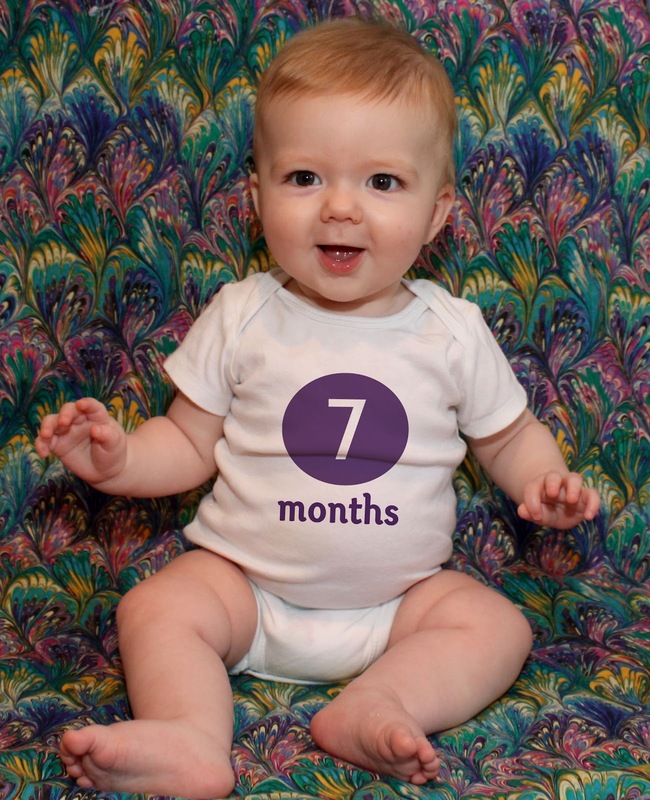 How is it possible that James is 7 months already? And how is it possible I say the same thing every month? And how is it also possible that I am a month BEHIND and this baby is now eight months and I can be found cowering in my closet because he is sliding so fast towards a year. James is awesome. He learned to really sit up in month 7, found his voice and realized his brother is pretty great. He does NOT want to lay down any longer, but sit up and look around at everyone. He says “Ba, ba, ba, ba” really, really loudly. Sometimes he yells it, sometimes he sighs it, sometimes he growls it. The growling is my favorite. It comes out of no where and does not indicate that he is upset. He just wants to growl at you. Now the yelling “ba, ba, ba”; that tells you he is ticked and you better come figure out why or he is going to start to scream silently at which time you need to run over to where you have been ignoring him he has been playing independently or the bottom lip is coming and the loud wailing will commence. Everything close to James goes straight into his mouth. I hear all the time from Zach, “Mommy don’t let him chew on that, it is wet.” But his awesome big brother makes a trade with James so he can chew on something non-important to Zachary. James follows Zach with his eyes all over the place. In the mornings Zach will get into the crib with James and talk and play with him. I can always tell when James has spotted Zach as his tone changes to one of excitement and joy. It melts my heart and makes me slightly less annoyed that they are both up well before 7am.